Aalborg is a multi-faceted city - full of contrasts. A city with a lust for life and all of its pleasures. It’s also grand on a manageable scale. All the major city attractions are concentrated within easy distance. From fast-paced fun to peaceful oases. From a foaming draft beer to sublime gastronomy. From the Viking Era to the Middle Ages, to modern art. 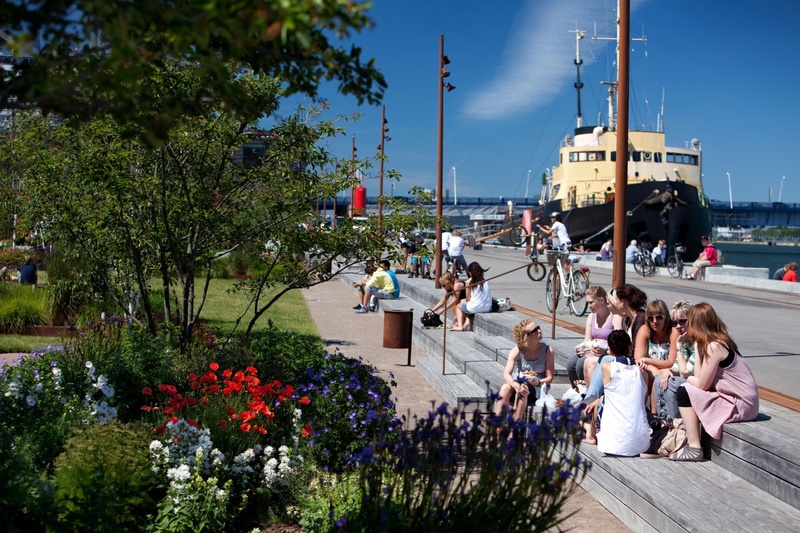 The city’s recently restored waterfront has much to offer for the outdoor and curious visitor. With its many open-air sports and recreational areas, the waterfront invites both active guests and those with lust for life. Near the waterfront you will find both the new Nordkraft and the architectural astonishing Utzon Center. Until recently, Nordkraft supplied the people of Aalborg with electricity. But now the old, coal-fired power station in the centre of Aalborg generates a completely different kind of power – Culture Power. The new eagerly awaited cultural powerhouse of Aalborg Nordkraft opened its doors in 2009. Nordkraft brings together culture, sports, and recreation, combining sports facilities, a cinema, theatres, and restaurants under one roof – all in a fusion of contemporary architecture and authentic industrial styles that create a very special atmosphere. With its unique, raw and industrial yet still stimulating look, Nordkraft truly reviels the identity of Aalborg. Aalborg has around 1,700 hotel rooms in the city centre, all of them within easy walking distance. Hotels are available in all styles: Crisp minimalism, a refined gentleman’s club atmosphere, or classic Scandinavian modernism. Aalborg has it all. The hotels have ratings up to four stars; no matter what category you choose, Aal¬borg offers exceptional value for money. The City of Aalborg has created a municipality where growth, knowledge and welfare are top priorities. Now the course is set towards the future. Storm P, a well-known Danish artist and humorist, once said that “nothing comes of itself alone, except fluff”. If we want change, we must act. And this is one area in which Aalborg has excelled as a city and municipality. Aalborg has gone from industrial town to modern knowledge city with a global perspective. The international perspective, in particular, has been decisive for the local development. With an original, high-quality education and research environment, higher education, with Aalborg University as its flagship, has put our university city on the world map. Aalborg is characterized by past eras. In and around the city, you will find relics of the past with stories to tell. The city’s roots go far back, and Lindholm Høje’s spectacular gravesite and dwellings are good examples of that. Lindholm Høje stems from the late Iron Age and Viking Era, and it is a magical and impressive sight that meets you as you stand and gaze at Lindholm Høje’s 700 or so graves and 150 stone ships distributed throughout the hills. Lindholm Høje was buried in sand in the 9th century due to heavy sand storms that ravaged the area and sent the Vikings fleeing. Aalborg’s location at the salty fjord, Limfjorden, made the city a natural choice for a merchant town. In 1342, it became a reality, and the town quickly became one of Jutland’s (Denmark’s mainland) largest market towns. Naval officer Skipper Clement was one of Aalborg’s best known figures of the 1500s, and he initiated an uprising among peasants in the town during the civil war, The Count’s Feud, in 1534. Skipper Clement’s forces were captured in Aalborg, and the 7,000-8,000 men died in an enormous massacre. Skipper Clement was later captured, and in 1536 he was executed at Viborg’s parliament. In the 1800s, industrialization came to Aalborg, and many factories sprouted up. The town became known for its many industrial smokestacks. The cement factory Aalborg Portland is a product of that industrialization, and in 2014 it celebrated its 125 year anniversary. Aalborg has undergone a huge transformation, and the city is no longer only known for its industrial past. Recently acknowledge as Europe’s Happiest City (Feb 2016), today Aalborg is also an attractive city for youngsters and students, and a cultural gathering point for diverse cultural institutions and leisure opportunities. Aalborg is an active youth and university city. Aalborg has a clear vision of being Denmark’s best youth city, and for that reason, youth have a high priority here. In recent years, much has been invested in Aalborg’s power of attraction, so young people come to the city to study, live and work. Turning Aalborg into an attractive university city has been an overwhelming success. The number of students has grown, and the huge boom is also reflected in the population figures, where, today, one in five residents of Aalborg Municipality is a student. In order to meet students’ housing expectations, approx. 4,500 new student housing units for youth has been and is being built in Aalborg in the period 2009-2016. Not only Danish students choose to study in Denmark, around 2,500 international students live and study in the city. Aalborg Municipality takes care of the new students with its “Roof-over-your-head guarantee”. The housing guarantee applies to all new students seeking a place to live through a student housing organization. Aalborg Municipality has prioritized offering students the opportunity to live in attractive and centrally located youth housing. Larsen Waterfront is one of the newest constructions – a 15-storey building with 251 student flats at Aalborg Waterfront, which you will find when you stroll through the city. With its abundance of shops Aalborg’s high streets are an eldorado for anyone who loves to shop. But, whatever you do, don’t miss the side streets. They are packed with exciting little shops selling the work of young designers and craftspeople. You never know what you’ll find. Read more about shopping streets here or about Friis Shopping Centre. Friis Shopping Center has longer opening hours than regular shops. Monday-Friday 10AM-7PM, Saturday 10Am-4PM, and 1st Sunday of the month 10AM-4PM. Even when staying in the city, beautiful oases of nature – perfect for a great work out – are never far away. A different experience awaits you, if you go for a run in Mølleparken during twilight. Here, you can follow a 2.5 km route lit up by lanterns. Please ask your hotel or look here for inspiration. Danish currency is ‘kroner’ (DKK), EUR 1 is equivalent to DKK 7.5 and USD 1 is equivalent to DKK 6. Banks are open from 10.00AM-04.00PM Monday to Friday. Though, in most hotels, restaurants, cafés and shops international credit cards are widely accepted. Tipping: In Denmark, tipping isn't common - all service bills that you receive already include gratuity, and it is unnecessary (but always appreciated) to add a tip in Denmark. Aalborg is situated in the Northern Denmark. Weather in Denmark varies with the seasons. Denmark has a temperate climate and can be humid and overcast. The winters are usually mild and windy, and the summers can be cool or sunny. The weather in Denmark is a popular subject for discussion as it often changes from day to day and even during the day. It is therefore a good idea to bring a coat or an umbrella on outdoor activities. To check the weather forecast when you visit Aalborg, please visit the website of the Danish Meteorological Institute for the latest forecast. Electrical appliances run at 230v/50Hz in Denmark. Electrical outlets in Denmark use a two-prong plug typical for continental Europe. Most laptops will automatically work with 220-240 volts (check the back of your laptop for power input markings). The conference is a non-smoking event and smoking is prohibited throughout the venue. Generally speaking, Denmark is a very safe country and Aalborg is a particularly safe city. Like in most major cities in the world, however, it is advisable to watch ones belongings and valuables while being in public places and to keep cars locked. Moreover, Aalborg is the happiest city in EU (2016) and a city in a country listed in the absolute top of rankings like; least corrupt country; most prosperous country; most peaceful country; and best country for women. In case of emergency please dial +45 112 to contact ambulance, police, or fire department. In case of serious illness or injury dial +45 112. Hotel staff can also direct you to hospitals or dental clinics. For non-emergency sickness the medical authorities recommend consulting a doctor instead of going to the hospital. Your hotel will be able to recommend you one. The water from the tap is sufficiently clean for drinking – and well tasting. You should try it out. If you need a visa to enter Denmark please contact the conference secretary as soon as possible to get an invitation letter to present to your local Danish Embassy. A processing time of up to 3 months should be expected. In order to get the invitation letter we need an official statement (stamped) from your employer/institution confirming that you are employed/enrolled accordingly. In the statement it must be stated that your employer/institution will cover all expenses in connection with your trip to Denmark.